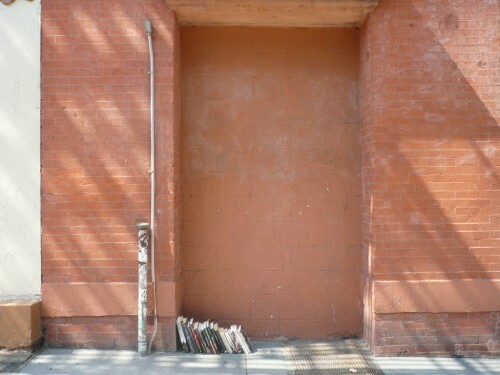 Lost Library (#lostlibrary) was a social media performance that took place in New York’s Soho district every day for three weeks during a heatwave (June 19–July 6, 2011). 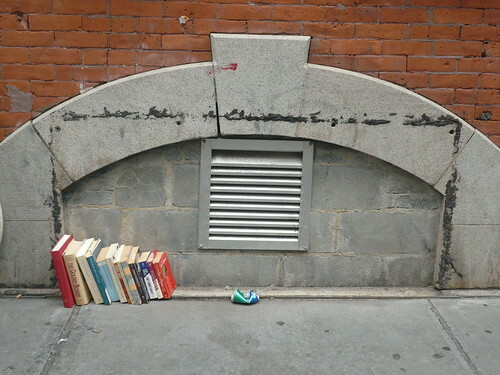 Instantaneously shared online via Twitter and Tumblr, Lost Library enacted and documented the simple act of sharing books. Every day I weeded books from my library and placed the discards in themed stacks. Using two cotton tote bags, I carried as many of these as I could to nearby locations. 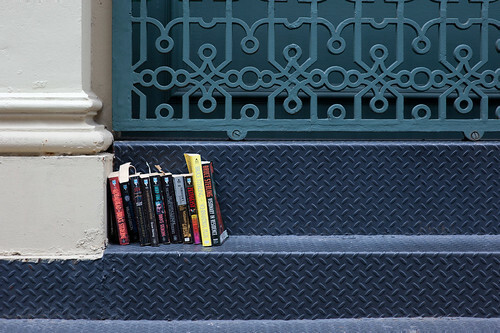 Once I had deposited the books in a window well or stoop, I tweeted the location coordinates and a photograph with my phone. The tweets, images, descriptions and coordinates posted to Tumblr and Facebook simultaneously. Although my distribution method relied on the ubiquity of social networking tools, #LostLibrary’s central act of exchange -- the sharing of books -- is anchored in the material world. This 'performance' re-familiarizes us with habits of material exchange such as gifting, barter, and sharing, that lie outside profit-motives and markets. In a rapidly expanding paradigm that encourages us to license our content rather than buy and own it, we are increasingly locked into terms and conditions that can prevent us from sharing and exchanging freely. #LostLibrary points to our contemporary quandary over sharing in a world of increasingly virtual 'ownership' and asks us to consider the drawbacks to our new-found immateriality, and what we might be losing as we leave behind the heft and inconvenience of so much printed matter. tweet the location with a photograph and the hashtag #LostLibrary. These are books for people to browse and to take away if they like. Documentation is archived on flickr and tweeted photos are posted to tumblr. context provided by the North American Potlatch, Fluxus, Mierle Ukeles, Marcel Mauss, The Gift Economy, Jacques Rancière (2004) The Politics of Aesthetics: The Distribution of the Sensible, Claire Bishop (2006) Participation , Lewis Hyde: The Gift (1983) and Common as Air (2008). I am sharing the library that I've been accumulating for 15 years by giving some of it away. Begun on June 19th 2011, Lost Library is an ongoing social media performance. 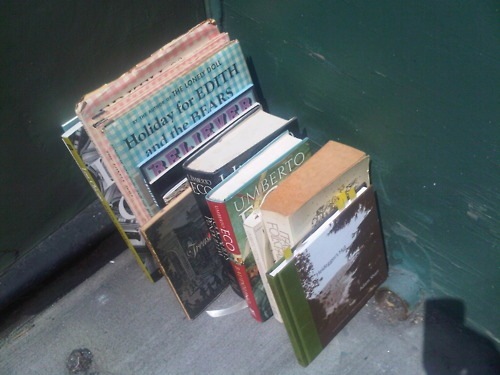 Five days ago I started sharing my personal library by depositing selections of books in the window wells of Soho. These wells offer a dry place as well as a 'natural' book shelf that invites passersby to stop and browse. Upon depositing these books, I immediately shoot a photo and tweet it, along with their location and the hashtag #LostLibrary. 8:21pm Wednesday July 6: After 37 deposits stretched out across 3 weeks, Lost Library is now closed. Thanks to everyone who followed, appreciated, stalked, quipped, riffed, re-posted and enjoyed. I am sharing the library that I’ve been accumulating for 15 years by giving some of it away. Every day I will pick a good window well in Soho, deposit some books, and immediately tweet the location with a photograph and the hashtag #LostLibrary. These are books for people to browse and to take away if they like. Documentation is archived on flickr and tweeted photos are posted to tumblr. Begun on June 19th 2011, Lost Library is an ongoing social media performance. I want the Smithsonian Books volume of Space Time Infinity, which could ostensibly still be languishing on Grand between Broadway and Crosby. But probably not! PS: Also new by Joy: Virilio Now, which I want to have an exclamation point at the end but sadly does not, being the title of a book and all! 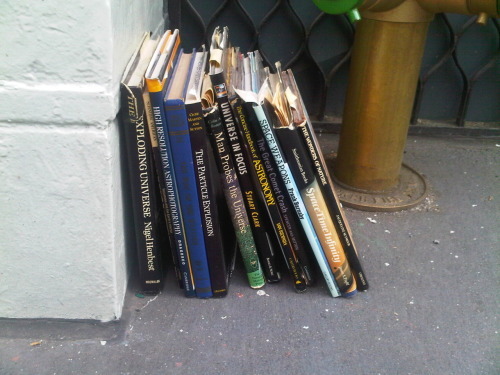 I just ran across one of Joy Garnett's Lost Libraries on Crosby — at least I assume it was Joy's. I would have taken a book, but I've already read all the Sterling and Gibsons I want for now. So I took a bookmark, an LIRR Off Peak 10-Trip Ticket, all punched out. OK, I'm freaking out a little bit right now. On June 28, 2006, exactly five years ago today, DT published Marjorie's review of The Lonely Doll as part of the Daddy Types Bizarre Childrens Book Contest. 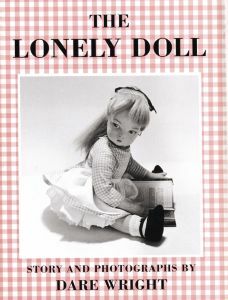 The Lonely Doll was the first of ten children's books by model-turned-photographer/author Dare Wright, and boy, are they freaky. Anyway, flash forward to June 28, 2011, and New York artist Joy Garnett's ongoing #LostLibrary project. 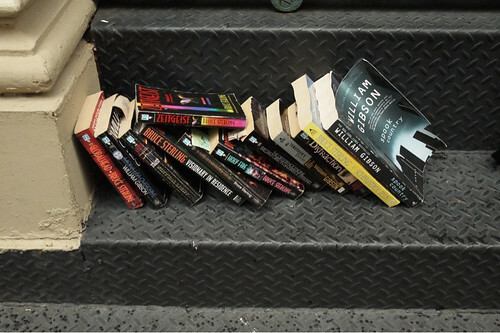 Garnett's liberating her book collection by placing thematically organized stacks of books around SoHo, and then posting a photo of the stacks on Twitter, so folks can scurry over and take them. And what just turned up, minutes ago, on Greene Street, between Broome and Grand? "The Lonely Doll and dreamscape architecture." Hop to, unless they are too freaky for you, which they very well may be.